Seahorses, Pipe Fish and Sea Dragons are normally animals that are on the top of all divers bucket list. An encounter with these magical creatures is really something special. 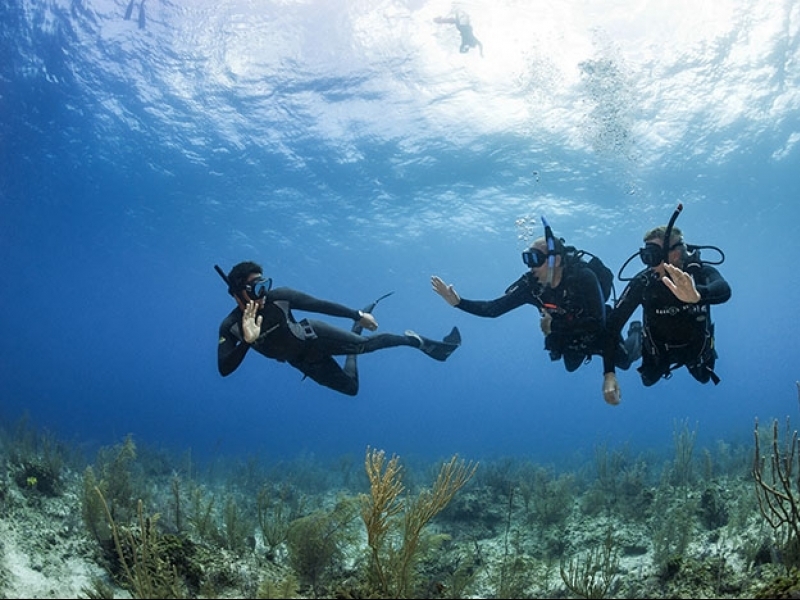 Their venerability and passive nature touches any diver who is lucky enough to interact with them in the wild so we are all compelled to want to protect them. If you love these animals and want to be a volunteer and help as a citizen scientist to gathering data, take photos and recording their locations onto a community geo-database; then keep reading! It is interesting to know that the majority of Syngnathid’s are categorized as data deficient by the International Union for Conservation of Nature. Which means that insufficient data exists to make a proper assessment of the conservation status of the species. This poses a great threat to cryptic species like these, so we as divers need to act to protect them. As recreational divers it is comforting to know that our councils and their workers are also taking steps to assist in their protection. Due to large storms in April, a large number of netted swimming enclosures in Sydney where destroyed. These hanging nets create the perfect habitat for anumber of Sea Horse and Pipe fish species, as well as the food they love toeat. One of these terminally damaged nets was located in Sydney Harbor on the foreshore in Manly council. With the majority of the net torn and resting on the ocean floor, it was scheduled to be removed and replaced by an environmentally minded contractors working for them. Due to our regular assistance with the Weedy Sea Dragon photo-tagging program, Abyss Scuba Diving was asked to assist with arelocation process of a large number of Hippocampus Whitei, a small seahorse regularly observed by divers in Sydney. Due to the high density of this population we believed it was important that everything possible was done to help reduce the impacts on this community, so we where extremely happy to assist. We also has the dedicated staff from Manly Sea Life who consulted on the methods used and gave professional advice to all the volunteers on the safe handling andrelocation of the animals. A particular shout out goes to Robbie McCracken, senior aquarist and volunteer coordinator for his advice and guidance during the activity. Please note that the process used was formally approved by the Department of Primary Industries through official permits obtained by the contractor. Under no circumstance is anyone permitted to touch, relocate or remove any Syngnathid species in Australian waters. It was made illegal and comes with a nice $50,000 fine for anyone found guilty of such an offence. During the removal we relocated 113 individual Sea Horses in lots of 5. 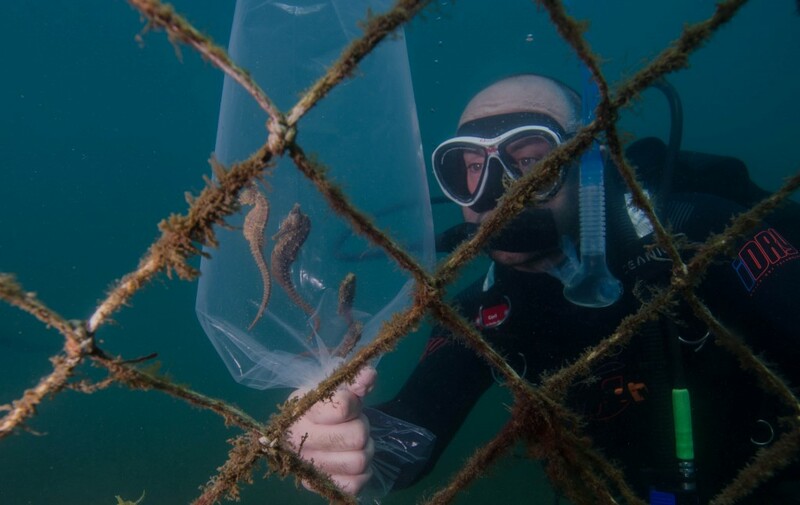 As you can see by the photos, we used a thick plastic bag which allowed us to remove the sea horses from the damaged net and transport them into a prefabricated holdingarea which was created by the contractor before we began. The bags allowed us to swim with the animals without letting the water drag on their bodies, so it was a relatively stress free transport over to their new temporary home. We found some previously tagged Sea horses which has been released into the area previously from researchers. Check out the video to see the process used for tagging them. Once we finished searching the damaged hanging net for all the animals, the contractor then dropped the remaining net to the ocean floor. In the hope to leave as much potential habitat in the ocean, the old net was bundled by divers and left in place on the ocean floor. The relocation zone will remain in place for a period after the installation has been completed to allow for a natural transfer of the sea horses to the netting enclosure. Due to unfortunate but necessary disturbance of this amazing and unique community of sea horses and also our natural passion of them, Abyss Scuba Diving with the help of the staff of Manly Sea Life have decided to create an ongoing Syngnathid monitoring program that spans the entire Sydney basin. Called the Sydney Seahorse Survey, the program will involved some basic training with an orientation session which volunteers will be required to attend. If you are a photographer you are going to love this! Not only will you get some breathtaking photos of these unique animals but your photos will not just go to facebook, but it will be put into an ongoing geo-tagged database which will graphically show all volunteers where these animals are located. If you volunteer your photos into the date base you do agree that the program has the right to use the photos for the purposes of data collection and to help promote he program to get other volunteers interested in the program. Basic Anatomy, Distribution, Habitats and feeding habits of Syngnathids. How to volunteer as a citizen scientist and collect meaningful data on the Syngnathids we encounter in the wild. How to enter your photo data into a volunteer only map data base, including learning how to geo-tagyour photos of your recorded animals so you can plot them into the locator map. 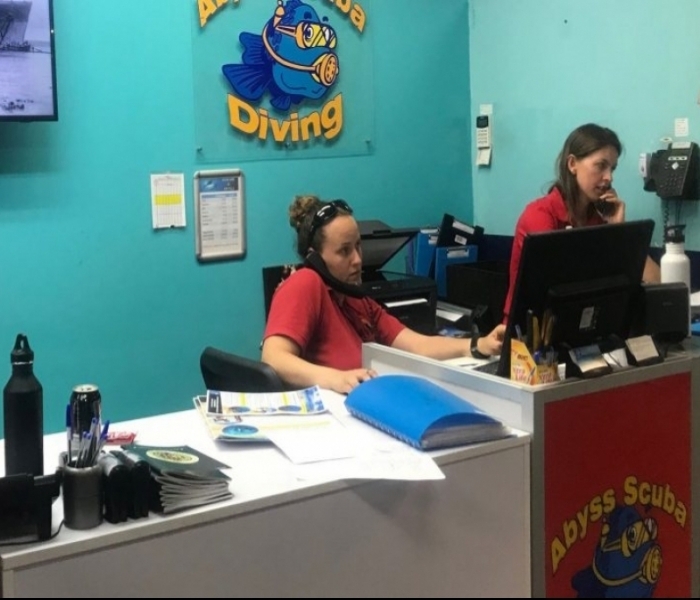 After two separate Photo Survey Dives coordinated by our staff here at Abyss Scuba Diving, you will then graduate to a fully fledged Seahorse Surveyor and be trained to collect more intricate data which would involve a visit to Manly Sea life. While we are there you will visit the Seahorse exhibit to learn a lotmore about Syngnathids by Robbie. He will teach you how to conduct the moreintricate counting and sexing procedures, and you will then gain access to the volunteer only data base entry porthole to contribute you collected date. After the training session with Robbie, we will then dive the new netted enclosure which is next to Manly Sea Life. This will allow us to track the re-introduction of the effected seahorse community onto the newly installednetting structure. The data collected at this site and others like it around the Sydney basin will help develop and adjust the procedures used in the future to reduce the long term impacts on communities like this.